we walk up some stairs, pay the entrance fee at a small ticket booth, and step into the garden. My jaw drops. I am immediately enchanted. In front of me is a black tiled grand piano sitting in the middle of the garden. It is named Sweet Patooti and there is music coming from it. The lid of it is raised and the underside of the lid is a mirror. The inside is filled with flowering cactus plants that are reflected in the mirror. There’s also a couple of ceramic dancing figures in front of the cactus plants. A yellow tiled piano stool sits before the piano. . . . . . . and this is just the beginning. Beyond the piano, on the perimeter of the garden is a band. 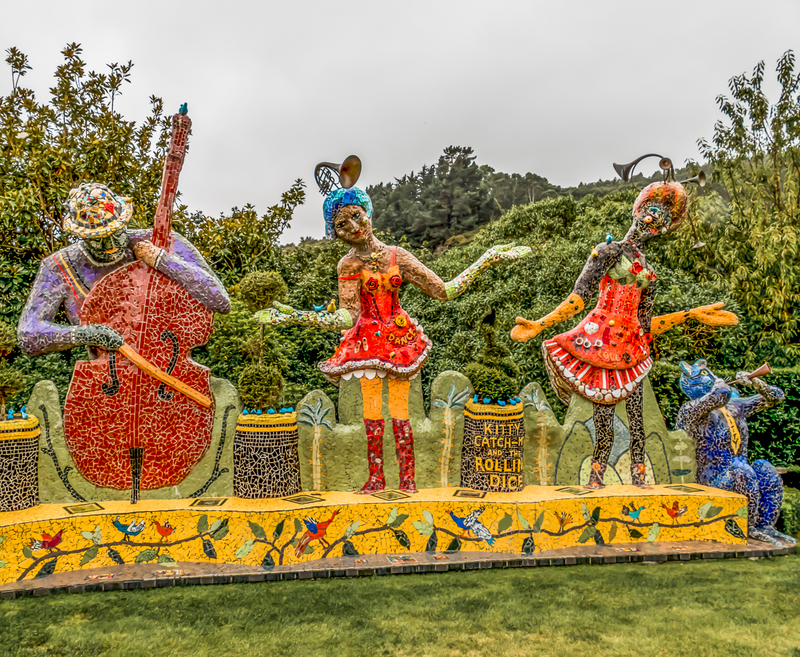 A larger-than-life whimsical band with a bass player, a couple of dancing girls and a trumpet-playing black cat. The name of the band is Kitty Catch-Me and the Rolling Dice. The black cat’s name is Kitty. The girls dance but perhaps they are also trumpeters, though their trumpets emerge from their heads. They are about seven feet tall, and all prancing colours and tile brightness. 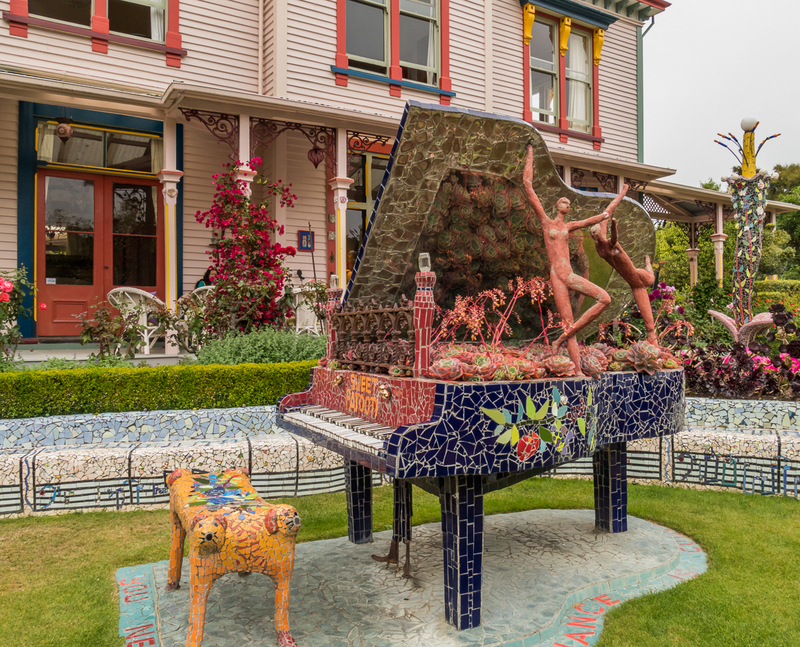 Beyond Kitty Catch-Me and the Rolling Dice, and beyond the grand piano is a garden unlike anything I’ve seen before. 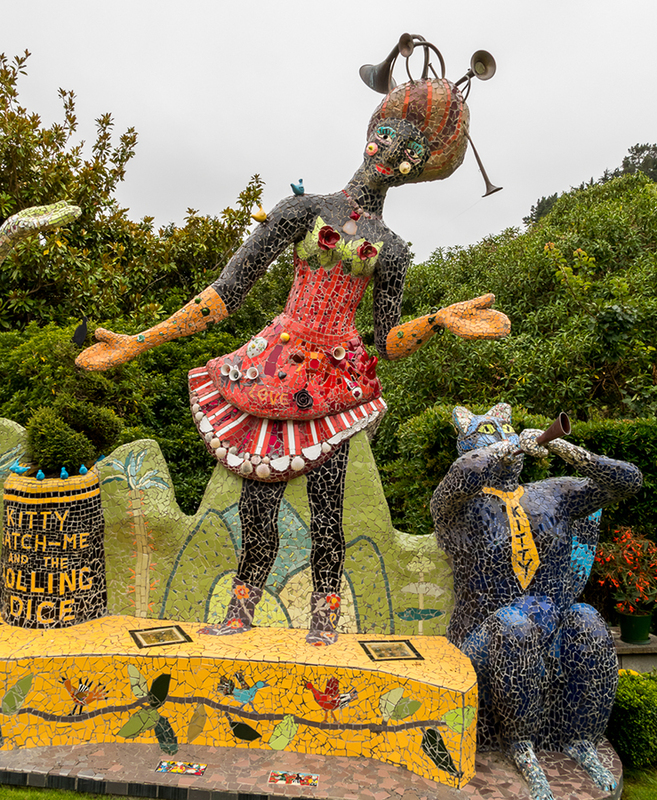 It’s a garden, yes, with trees and shrubs, topiary and beautiful flowers but it’s a garden inhabited and ruled over by a bewildering and unfailingly optimistic array of huge brightly coloured fanciful figures. I don’t know which way to look first. It feels as if I can’t see it quickly enough, as if I can’t take it all in. I’m smiling with delight as I move rapidly from one group of inhabitants to the next, and then stop and stare, utterly astounded by what I’m looking at. It’s charming, creative, humorous, and playful. At the same time it is a most serious outpouring from a gifted and inspired artist. 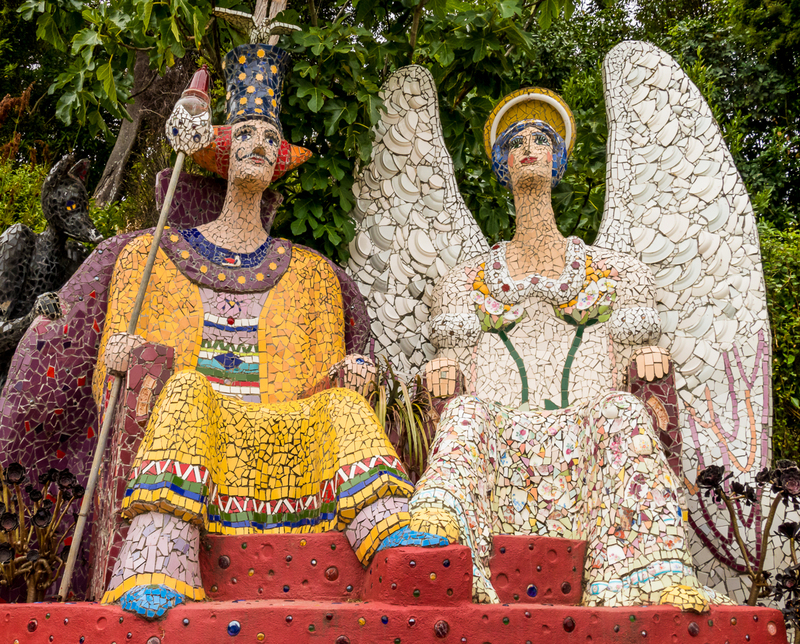 I am looking at, and trying to take in, a masterwork that just happens to be a large group of huge tiled figures spread throughout a hillside garden, the entire piece designed and created by one person. It is breathtaking in its scope. area giving a view of the whole garden. At every level there is something new to see. The entire place is astonishing and I am completely enthralled. It is so surreal! It is so eccentric! excursion to Banks Peninsula took us past it. 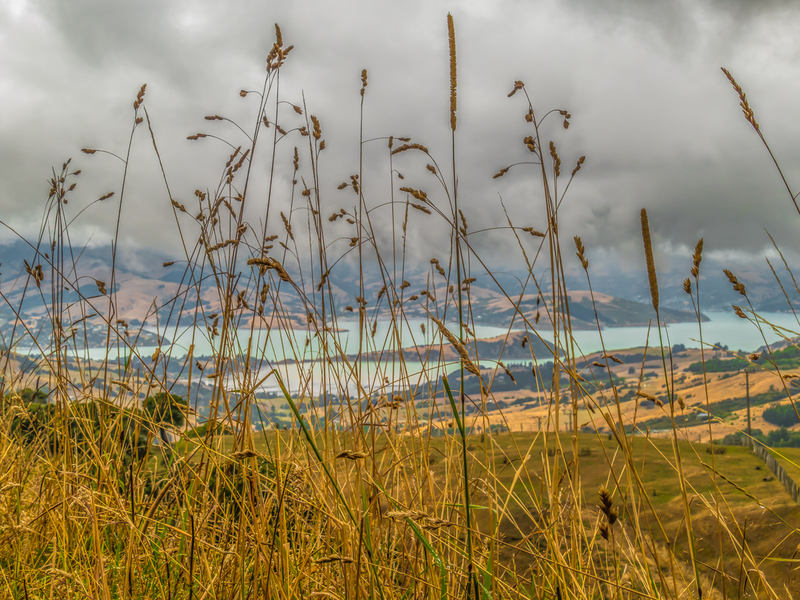 Banks Peninsula, a short drive from Christchurch, was formed by the ancient violent eruptions of two volcanoes. The almost circular coastline of the peninsula is an intricate lacework of inlets, small bays, and fishing villages. 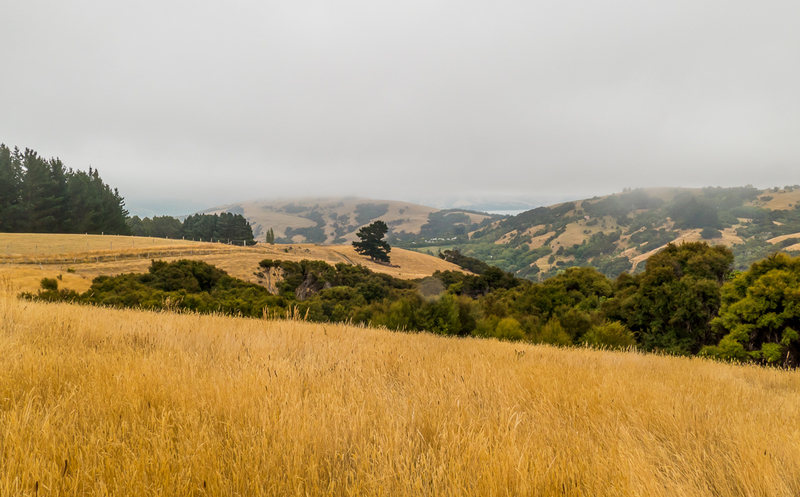 we hiked up above the town stopping at The Giant’s House then passing charming cottages, dark forests of twisted trees, and farmland. 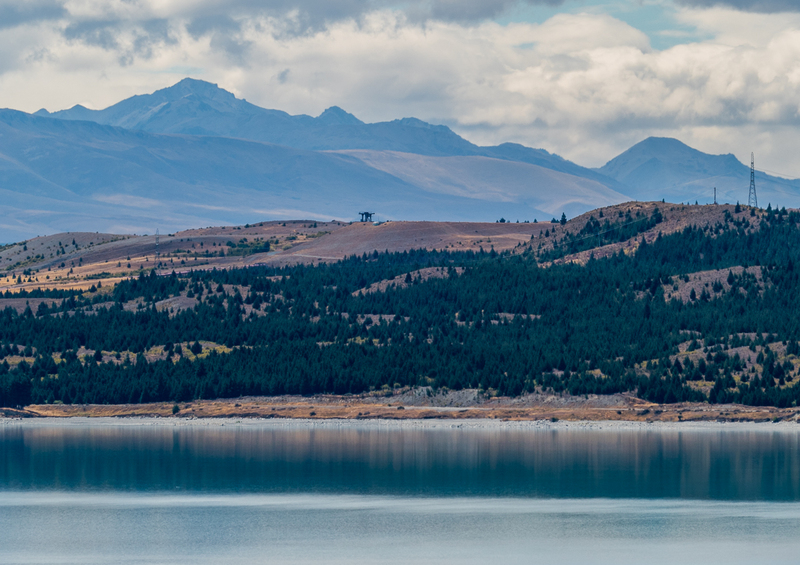 From Christchurch we drove to Queenstown. 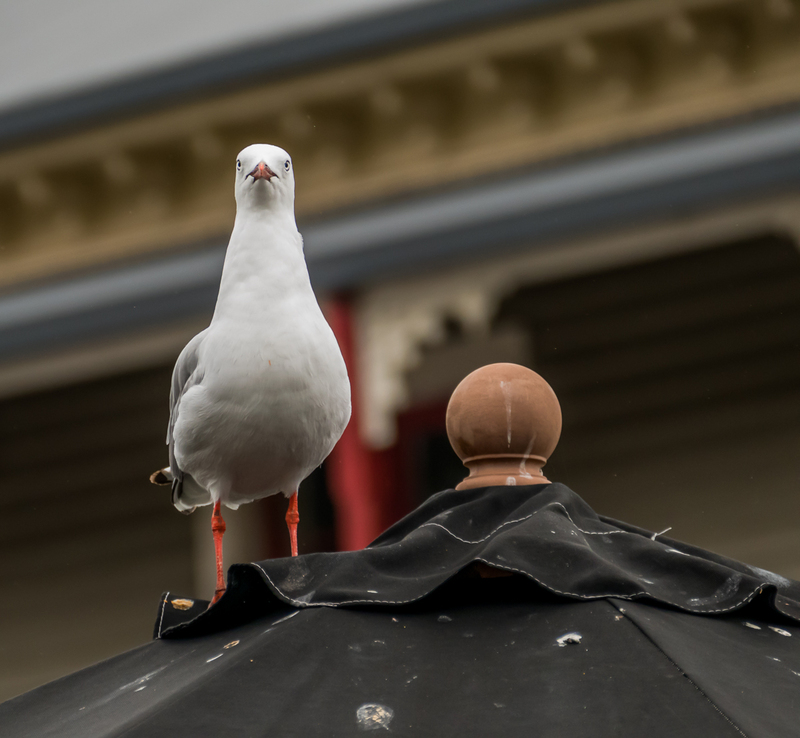 It would have made more sense to go to Dunedin first but our initial couple of days in New Zealand revealed two important things. 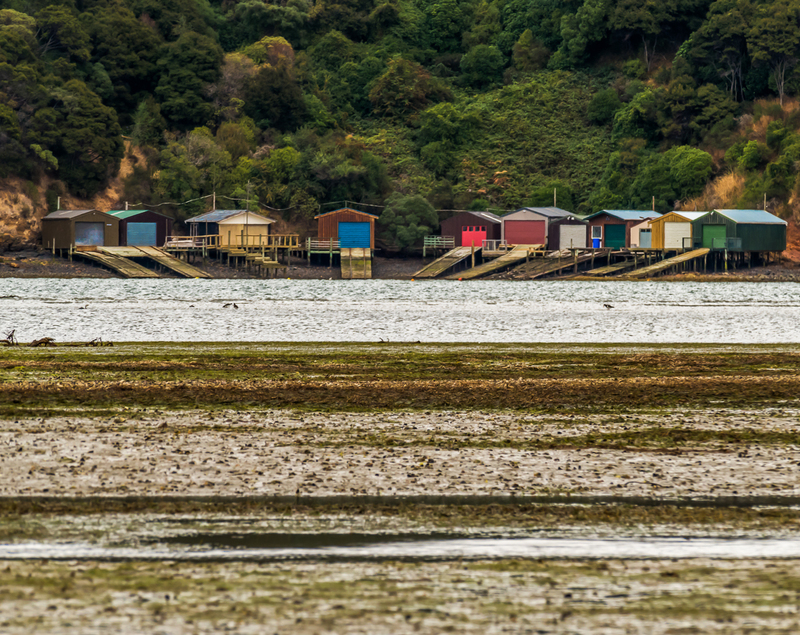 Even though it was late February and the antipodean school holidays were long over, tourism in New Zealand was not quiet. We commented on how busy the car rental place was when we picked up the car, and said that we thought it would be quieter because the school holidays were over. The reply was “That’s what everyone thinks”. We realised we had to start forming an itinerary, and make some bookings, fast. The other thing that affected our choice of direction was a determination to get to the famed but notoriously rainy Milford Sound on a sunny day. A quick look at the weather forecast showed us that our best chance in the upcoming two weeks would be ‘the day after tomorrow’. 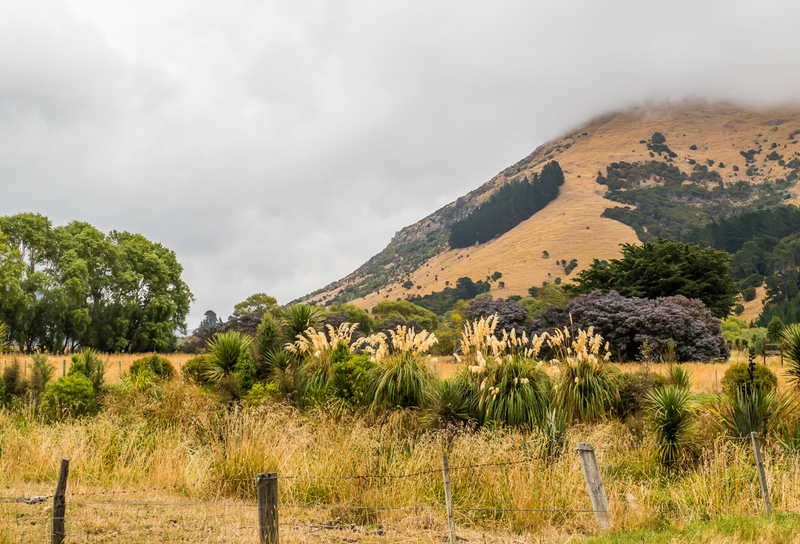 So after three days in Christchurch we headed to Queenstown, the gateway to Milford, stopping frequently to take in the beauty of the scenery along the way. Fiordland National Park lies in New Zealand’s largely uninhabited southwest and the scale of the landscape is magnificent: glacial lakes, valleys, and glorious fiords carved by glacial action over thousands of years. 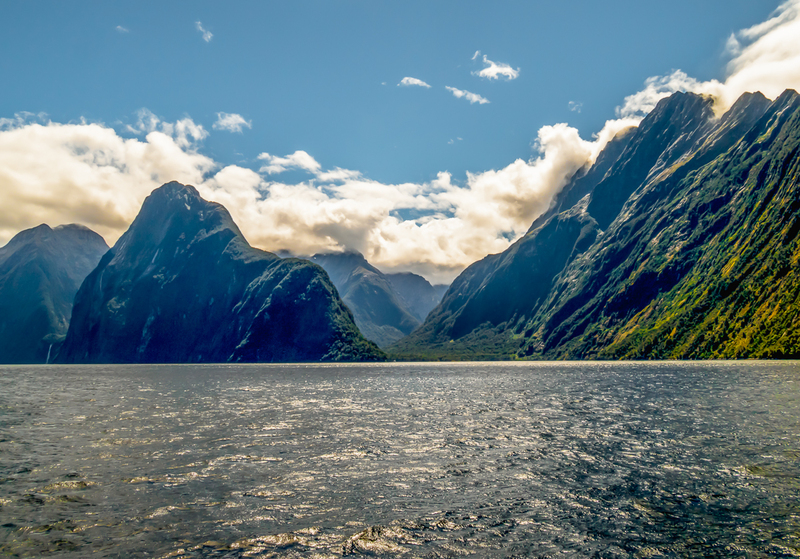 The northernmost fiord is Milford Sound and is the most popular tourist destination in the country. and Mirror Lake was unexpectedly beautiful, even on a grey day. and then, in bright sunshine, we reached the Sound itself, a setting comparable to anywhere in the world for its beauty. Despite the huge number of tourists annually, the place is serene and unspoiled. One of the delights of our cruise up one side of the fiord to the open sea and back down the other side was seeing a colony of seals. Some were sleeping or clambering on the rocks. Others were asleep in the water! The weather continued to be our friend. The next day we cruised Lake Te Anau on a brilliant blazing sunny day, visited glowworms deep inside a mountain cave, and the day after drove to the very Scottish town of Dunedin. All that in the next post. 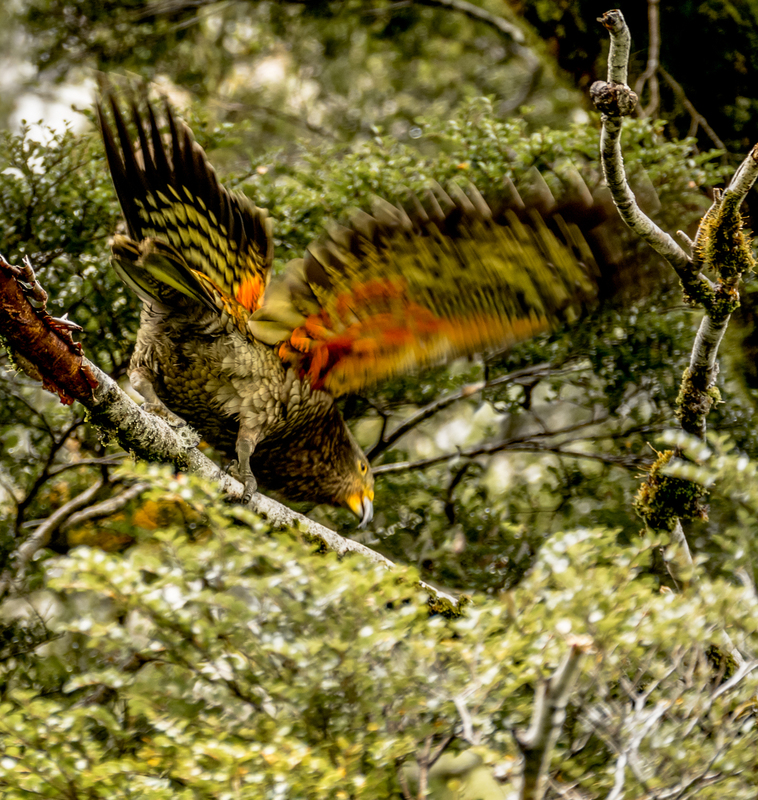 Awesome – I love your photos of the landscape – and what a bonus to get some great shots of keas as well. Great post. Thank you for sharing. Thanks so much Helen. 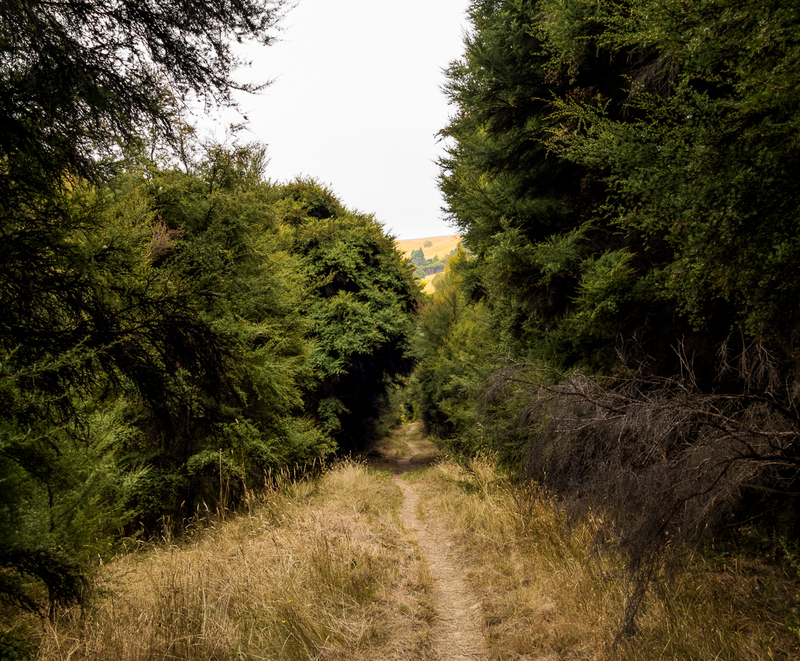 The NZ landscape left us constantly in a kind of joy. Everywhere we went it was beautiful. And the keas! How lucky. They were right there when we got out of the bus. I always get so excited when I get to see wildlife, especially when it’s so unexpected. In another place (North island I think) we saw wekas, a couple of families, with chicks. It was magical. I’ll show pics in a later post. Thanks SGMT. 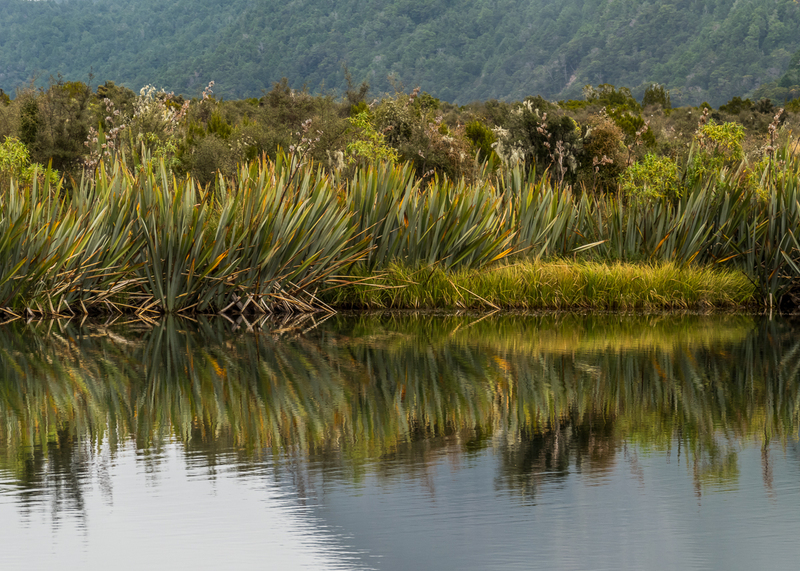 I’m glad you’re getting to vicariously enjoy NZ – it’s a very beautiful place – everywhere. So much natural beauty. We were almost always surrounded by it. A sleeping seal? I’ve always wondered how and where they do it. Fantastic picture! Thanks Helga. I was astonished by the sleeping seals. I’d never heard of such a thing. 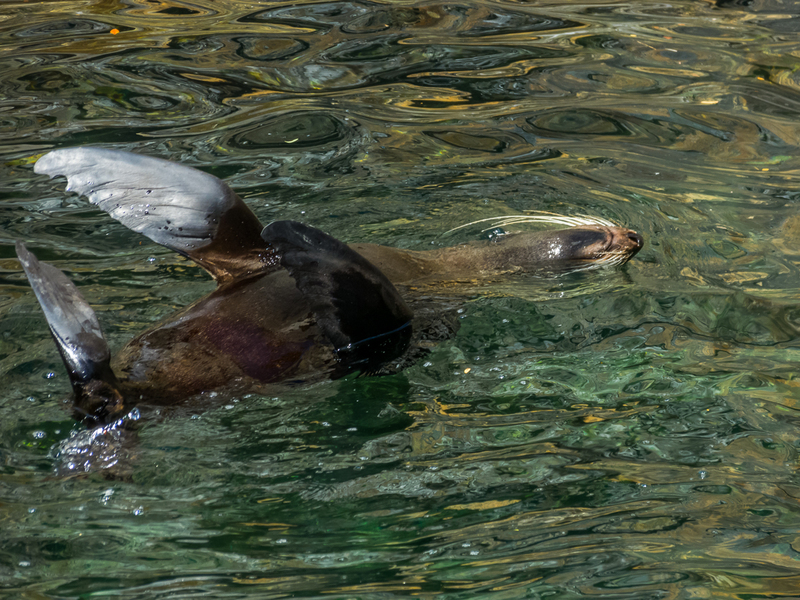 There were several of them asleep in the water and they all seemed totally at ease. Isn’t The Giant’s House amazing?! 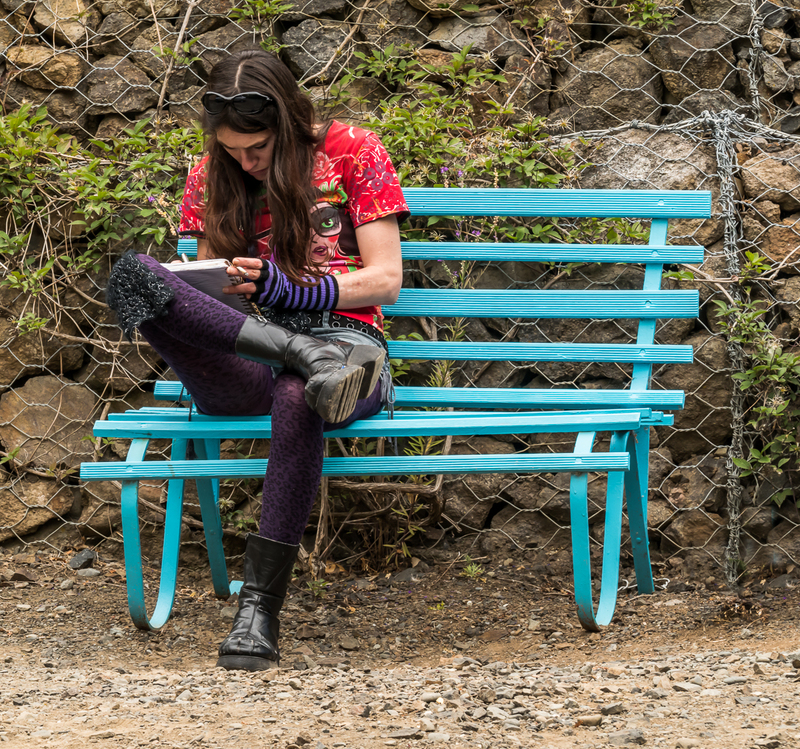 I was like a kid in a candy store – running from one thing to the next then slowing down to take it all in, bit by bit. Her imagination is incredible, and so unfettered. It made me smile the whole time. Alison – wonderful pictures! Thank you for sharing. Thank you so much Ruta, and you’re very welcome. Glad you enjoyed it! Love the artwork! Very Gaudi -like. Keas are such amazing, intelligent birds, and rather endangered – you were lucky to spot one! A biologist’s dream, haha. Yes we thought it was like Gaudi’s work too, though perhaps brighter colours. I couldn’t believe we saw keas! How lucky. There they were just by the road when we got out of the bus. So lucky! Thank you so much. Yes, it’s definitely a wonderful place to visit. 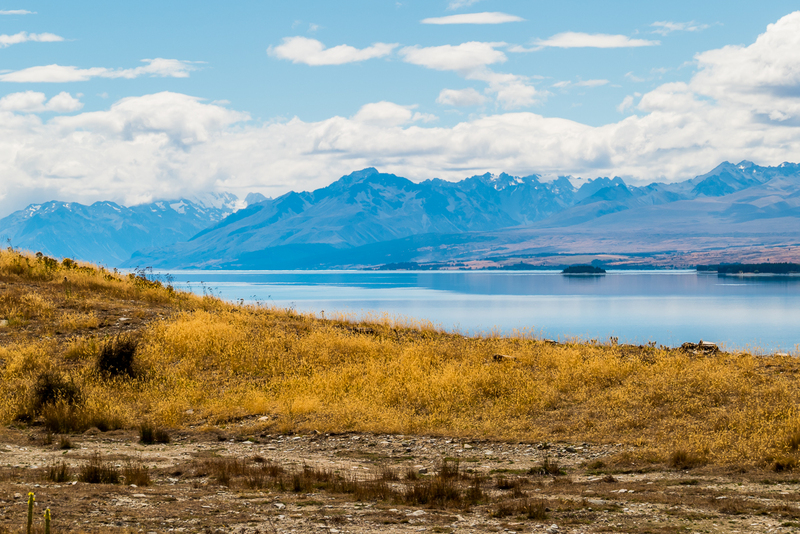 We loved out time in NZ – only had 5 weeks, could have easily have filled 8! Wow! 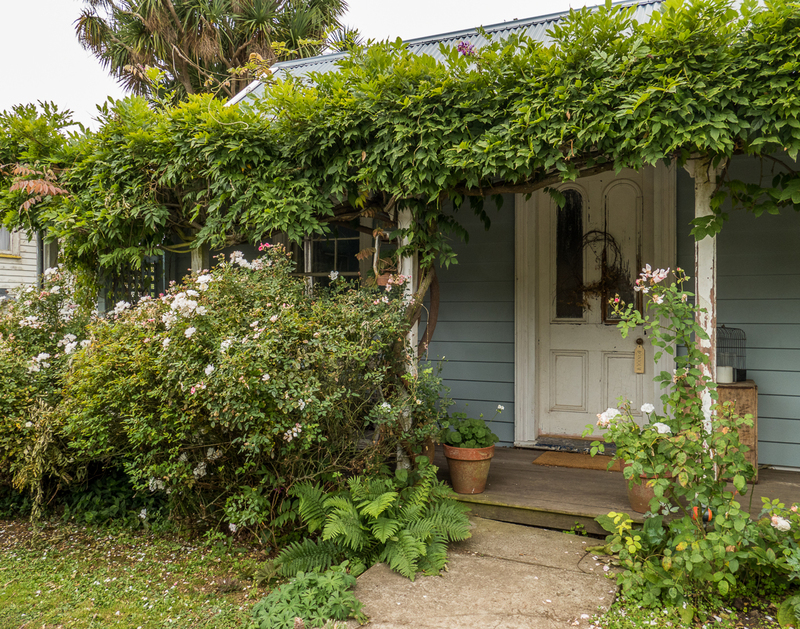 Love the house and garden and art — what a labour of love and creativity! Super post. What a contrast: Milford Sound and The Giant’s House. 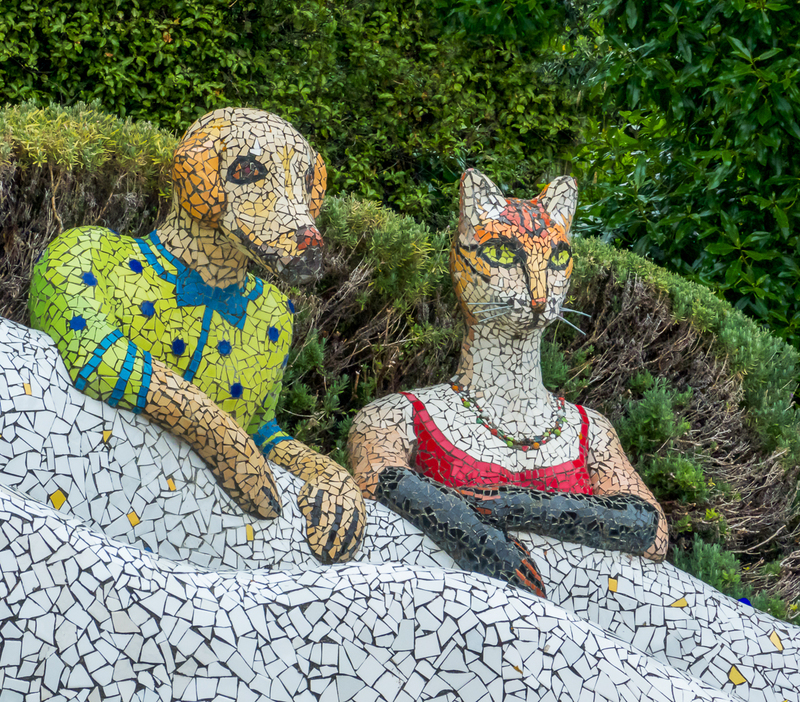 Mr. Dog and Ms Cat leaning on the wall remind me a little of Gaudi’s Parc Guel in Barcelona. 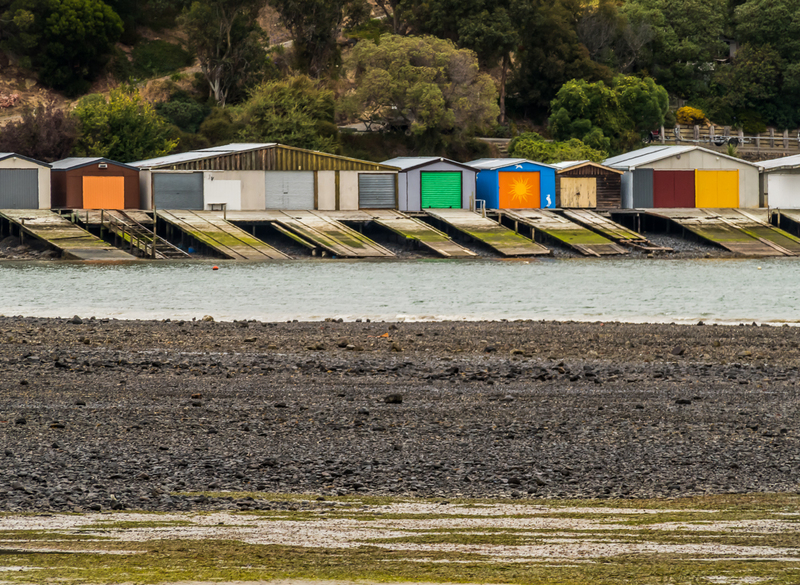 Milford, of course,has a curiously familiar feel to those of us on the wet coast… except for the sun thing in the sky. Thanks Keith. Both places were wonderful in their own way. Josie Martin’s work reminded us of Gaudi too. 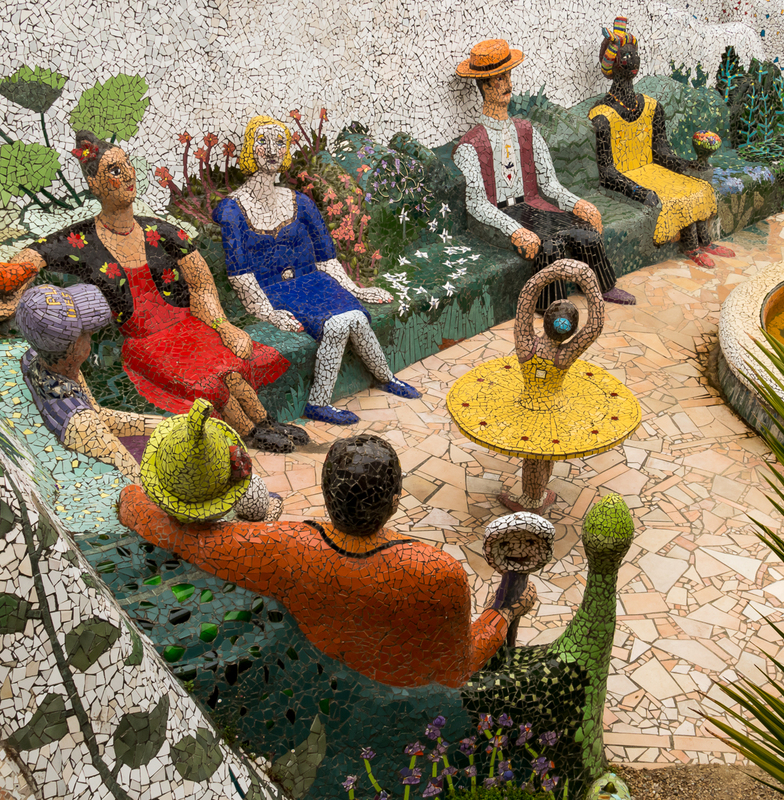 We loved Parc Guel – also imaginative and whimsical. Milford is just glorious. One of those natural settings that really takes your breath away. There are a few places I’ve been that are like that – the other that comes to mind at the moment is Grindelwald in Switzerland. In the garden, the plants were also extraordinary. I am always amazed with what people do with their plots of space. And then, the absolute graceful beauty of the fjords. What a trip you are having! I too was very impressed with the garden – it was flourishing. 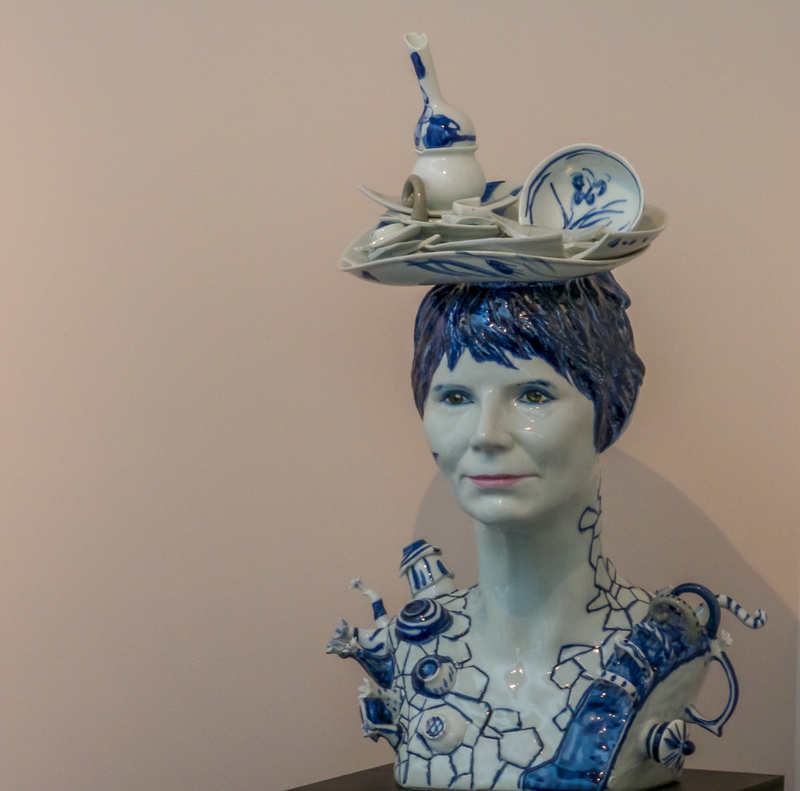 As an artist she’s quite extraordinary I think, but she’s no slouch as a gardener either. It was bursting with flowers and fruit. And of course Milford Sound was very beautiful, and I’m so glad we made to effort to get there on a sunny day. Thanks Curt, happy to have you along for a second visit to these wonderful places. There must be some very beautiful photos in your house. Isn’t it fabulous?! And to think we nearly missed it. I too was amazed at how much she’s achieved in only 15 years. Her home is also a B&B – I’d love to have been able to see inside but alas it’s a little out of our price range. She’s outrageous, in the best way. Her creativity seems to be limitless. Wow! And wow!! Just… WOW!!! You’ve taken the superlative to a whole new level. As if the gardens and whimsical mosaics couldn’t be more amazing, you show us Nature’s handiwork in cascade-carved fijords! I’m managing words, but am actually speechless. WOW!!! Thanks Jennifer! It was a very wow kind of place that Giant’s garden. I was dancing around like a child, couldn’t stop smiling. And then to get to Milford on a sunny day! It was exquisite. Feeling very blessed. 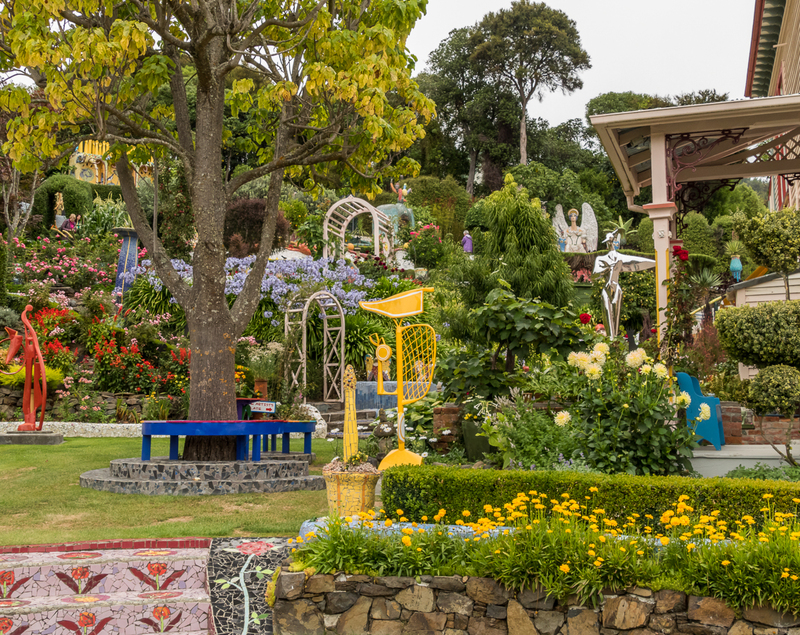 The Josie Martin garden was absolutely inspiring – art and foliage marvelously mixed. I think I’ll put some magical art pieces in my flower beds this year, it makes me happy to see the two together. Your response (above) mentioning Grindelwald took me back in time; a friend and I were “thumbing through” in the middle of the winter decades ago. Reading your blog is such a wonderful escape for me. Many thanks for that. Thanks so much Pam. I’m glad you’re enjoying the blog. Grindelwald in the summer is one of those places that is so beautiful you can hardly believe it. I’ve been lucky enough to have been there twice. 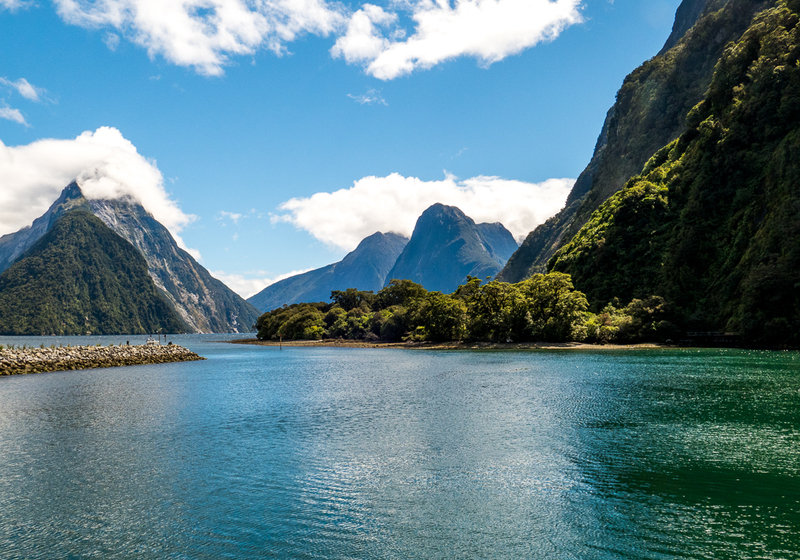 Milford Sound also – twice, and both times on a sunny day. You could make a whole project out of your garden. Who knows, in ten years you might have a work of art. People love anything magical! The Giant’s House photos make me think of Alice in Wonderland somehow. What a fantastic place. 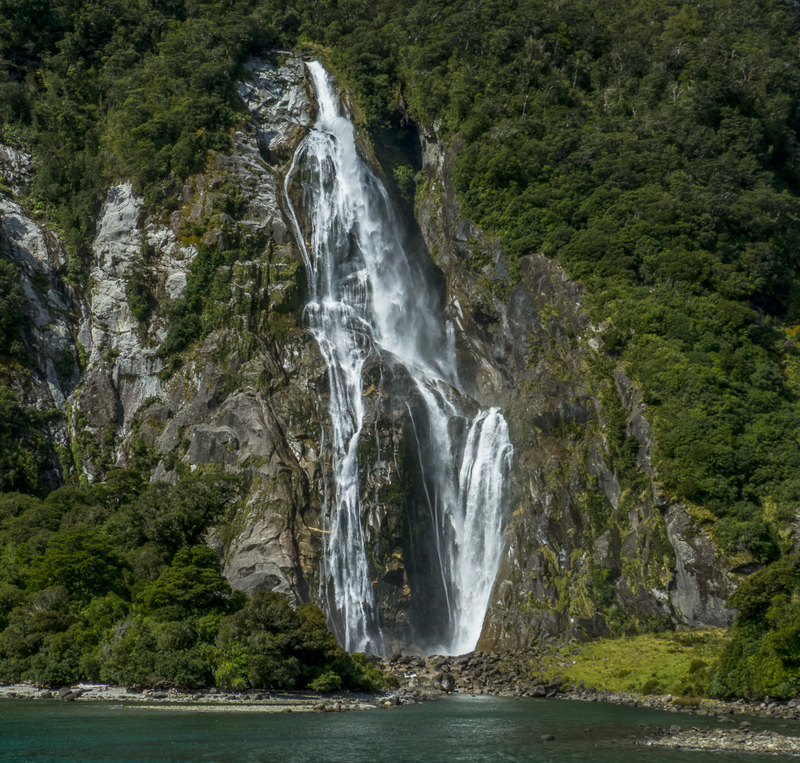 Your photos of Milford Sound are just lovely! Thanks so much Jo. And thanks for directing me over to Pommepal’s post about the garden. I think we both had pretty much the same reaction. Such a lovely and playful place. And of course Milford Sound is one of those iconic beautiful places of the world. There’s a reason everyone goes there. that parrot was something. fantastic pictures as always! Thank you so much. It was really wonderful, and completely unexpected to see that parrot! It was right by the road when we got out of the bus – talk about lucky! Thanks so much pommepal. 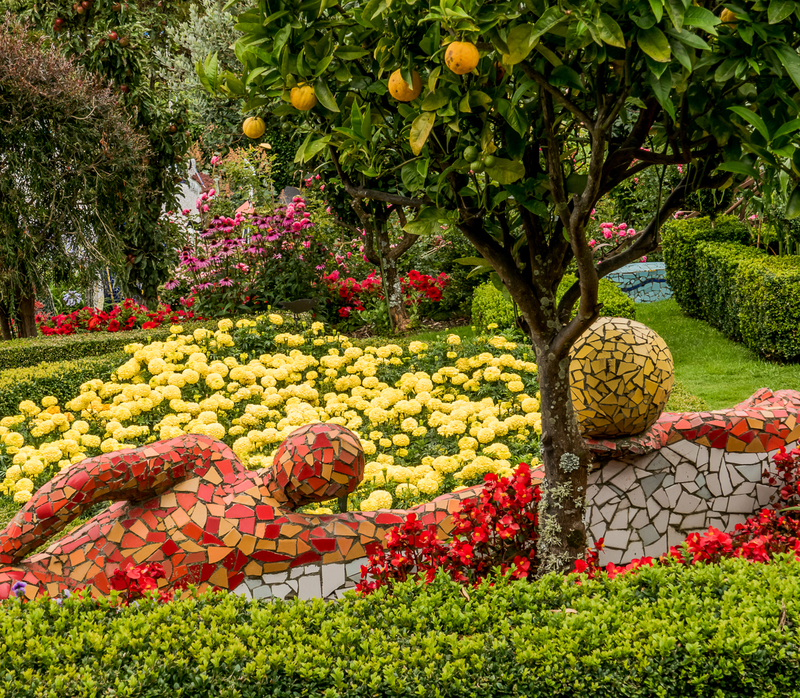 Yes, she is an amazing artist, and we’re so glad we got to visit her garden. I think I’ve been unbelievably lucky to get to Milford twice on sunny days! As for NZ being busy in Feb, we definitely fit into the grey nomads category, but we stayed in hostels for the 5 weeks we were there and they were full of people who were very far from grey. I think perhaps it’s also because uni doesn’t start til March which we didn’t even think of. NZ was our first time using hostels even though we’ve been on the road getting on for 4 years. We’d heard they are really good in NZ and it definitely proved to be true. We had a great time. I’ve since read they are also really good in Portugal. After our NZ experience we are much more willing to try them. Enchanting, enthralling – just lost for words to describe such beauty. Thanks so much for sharing, Alison and Don. You’ve brought such joy to my day. Thank you so much Ros. And you’re very welcome. I’m happy to think I have brought some joy into your world. New Zealand is so beautiful it’s easy to be inspired by it. Thanks Michael once again for your thoughtful comment. I do think we all have that playfulness and creativity – it is the playfulness and creativity of the Creator coursing through us, but as you say it gets obscured by the demands of, first and foremost, survival I think, and then the more sophisticated the society gets the more things the mind (with twisted myopic vision) makes up that must be done to survive (eg keeping up with the Joneses). I too fine the potential to create jaw-dropping, and that when true creativity is allowed to flow it does take what looks like years for a masterwork to emerge. I’m reminded of a gifted watercolour painter I know who when asked how long it takes her to do a painting replies 35 years. It has taken her that long to develop her skill and talent. Oh and the painstaking years it takes to create bonsai, and Japanese gardens, and the graceful ritual of the tea ceremony. I think presence is the key. Just be present to what is wanting to be done now. And now. And now. Sagrada Familia is one of the best examples! PS: I loved Michael’s comment before me, it feels like he’s captured so well in words my sentiment about the garden. Isn’t it fabulous?! So unique and creative and fun. I’m sorry I have no idea how long each one takes, but 15 years for all of them, and there are many, and they are HUGE! Some are way bigger than life size. I also loved Michael’s comment. 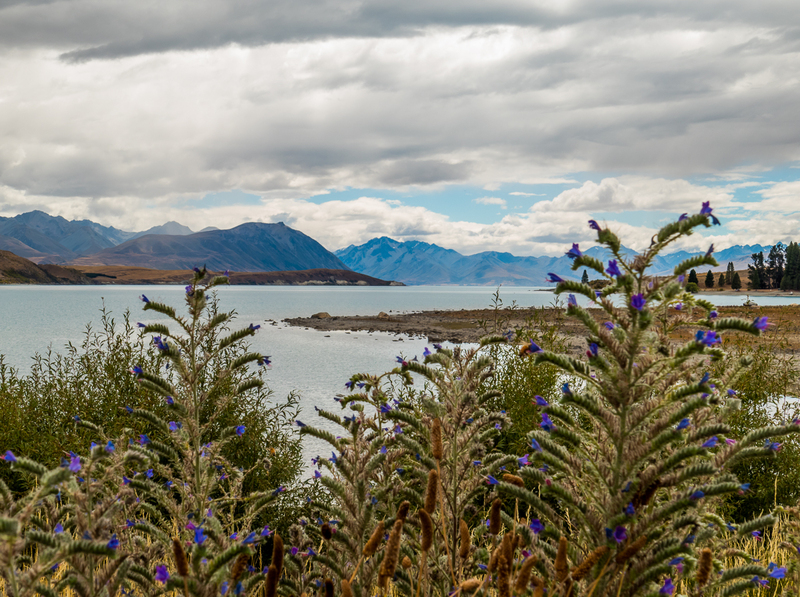 New Zealand is a very beautiful country – everywhere we went. Yes, we are very lucky to be able to see such wonderful places. 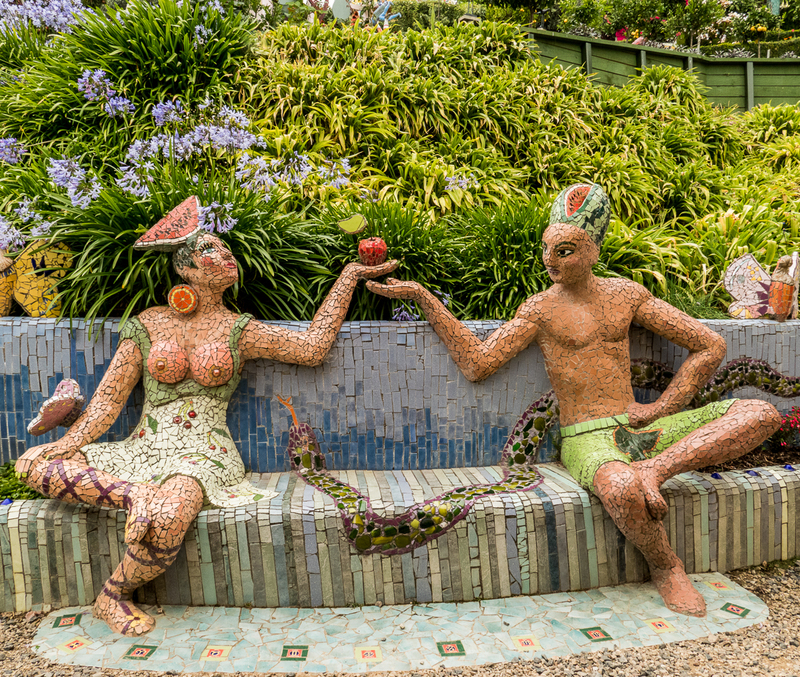 I think those sculptures took a very long time – but also that it was all a great labour of love. Joy exudes from the whole garden. Wow you brought me back to one of my favorite places on earth! I love New Zealand!!!! Beautiful pictures Alison! Thanks so much Nicole. It is one of our favourite places too. We loved every where we went. What a delightful find! 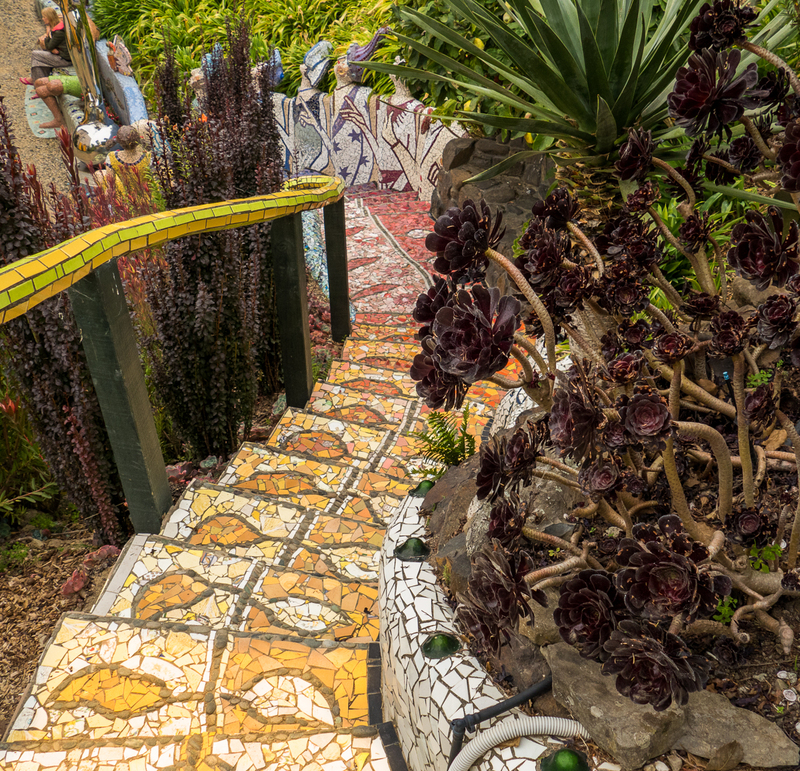 The garden is almost Gaudi like. New Zealand is amazing and your pictures capture it well. Thanks so much Darlene. We also were reminded of Gaudi, another artist who I admire greatly. And, yes, New Zealand is amazing. We loved it. I first opened this post while on a very busy trip and I just could not do it justice, so I’ve saved it in my inbox until I could really take my time with it. That house and its surroundings are surreal indeed – so fascinating! (I also made the mental link to Gaudi, particularly his Park Güell). The Christchurch to Queenstown scenery brought back wonderful memories of our drive there, and the Milford sound luck you had is just amazing! I might be willing to fly halfway around the world again someday to get that view after our own Milford trip was canceled due to the ubiquitous rain and clouds. The Giant’s House garden is a really unique and special place. I feel so lucky that we didn’t miss it, because I had forgotten about it and it was sheer serendipity that we chose to walk that way. I’m getting caught up on your blog after a week in Portland to see all my people. As usual, incredible pictures. The Giant’s House isn’t someplace that I would have stopped, but having seen parts of it, it’s on my list if I’m ever in New Zealand. Thanks Felicity. The Giants House is definitely worth a visit, as is Milford Sound which is stunning (but check the weather and go on a sunny day!) Hope you’re having a good time catching up with all your people in Portland – we’re doing the same thing as we’re back in Vancouver for a bit. It’s always so good to reconnect with home base. Oh my….this is one of my favorite posts, I think. The Giant House Gardens are delightful, but the landscape all around is so beautiful. I love your blog. Thanks so much Kay. It makes me happy to hear you’re enjoying the blog. I’m sure enjoying putting it together. We loved the Giant’s House – so unexpectedly imaginative and fun. 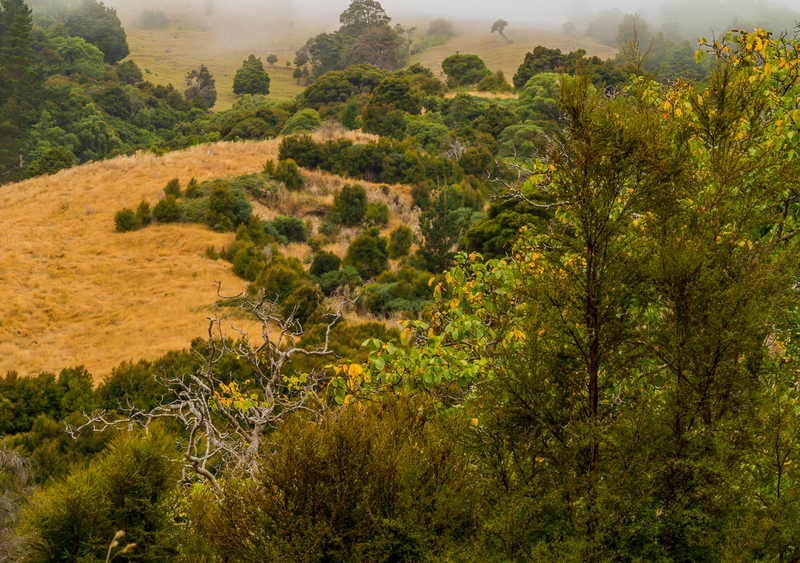 And yes, New Zealand landscape is so very beautiful – everywhere we went. Such a feast for the senses Alison! From the delightfully kitschy sculptures to the gorgeous fauna you encountered. Haven’t seen or heard of the Kea before. What a beauty! Thanks Madhu. 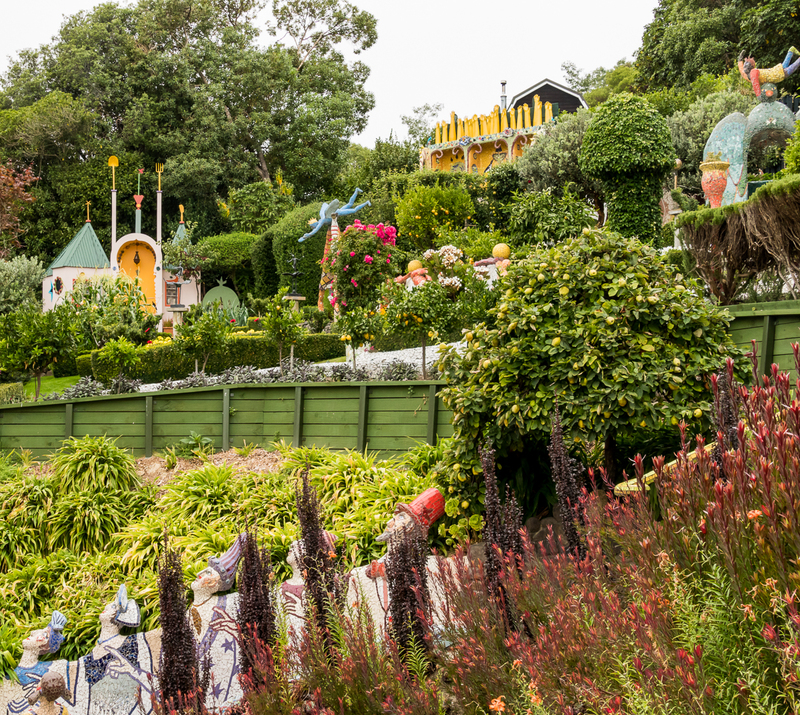 The Giant’s Garden was a wonderful surprise, and NZ was continually beautiful wherever we went. 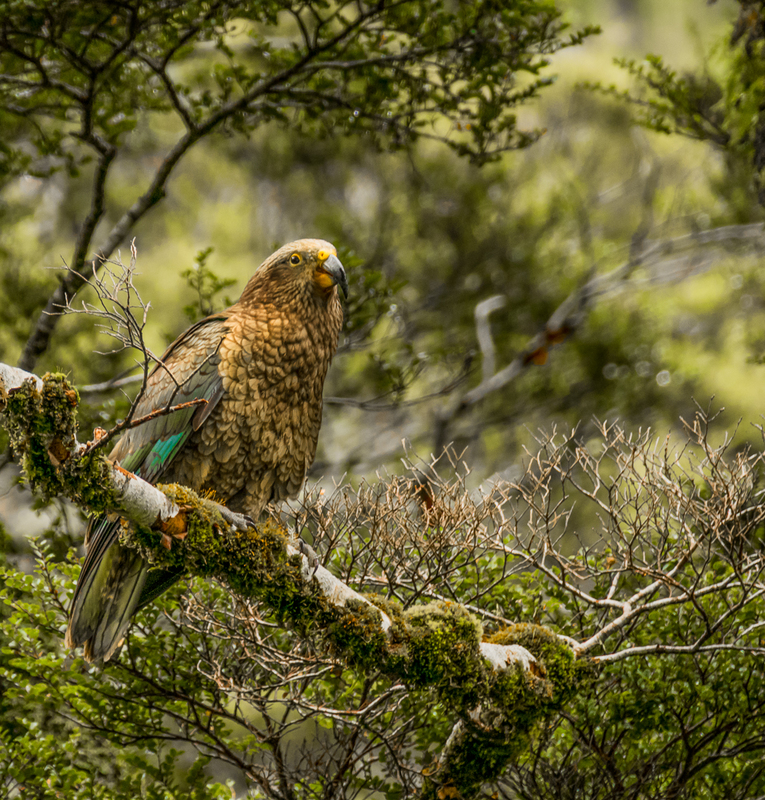 Seeing the kea was a kind of miracle – they are rare and it was right by the road when we stopped. Lucky! Alsion, Would you check your spam folder for my comment on your previous post? I am being marked as spam by random blogs for some reason! Wow, Alison. I’m just stumped for words with this post. The photos from Milford Sound look unreal – the clouds, the serrated mountains, the way the light played off the landscape and the water… and it’s amazing how the rainclouds parted before you got there. 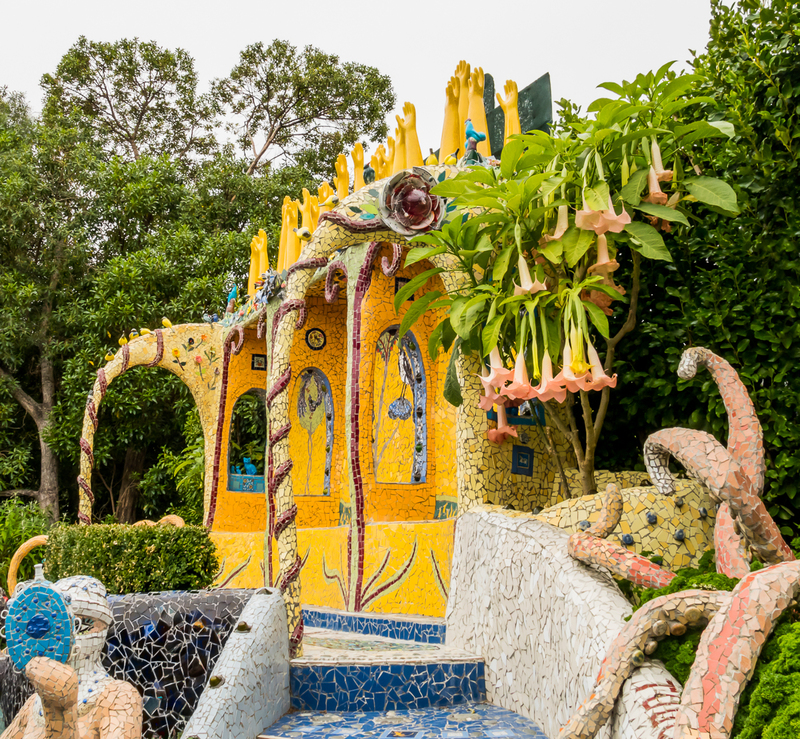 Josie’s garden is a veritable wonderland; the closest thing I can think of is Gaudí’s Park Güell, and I know I could have spent hours wandering around those fabulous sculptures. Thank you for introducing us to the Giant’s House! Thanks James. Milford Sound is definitely one of the great beauties of the world. I’m so glad I could share it with Don on a sunny day, and that I got to see it twice (!) on a sunny day. What luck. And Josie’s garden – what a delightful jaw-dropping surprise that was. It reminded me of Park Guell too, and of some of Gaudi’s other extravagances. So much creativity and fun! Thanks Holly. New Zealand is such a very beautiful place. I hope to visit someday. 🙂 You’re welcome. Yes the sculptures are amazing. Thanks for the recommendation about the app. I know Don just installed a new GPS app, but I’ll get him to look into this one. Have fun in NZ. 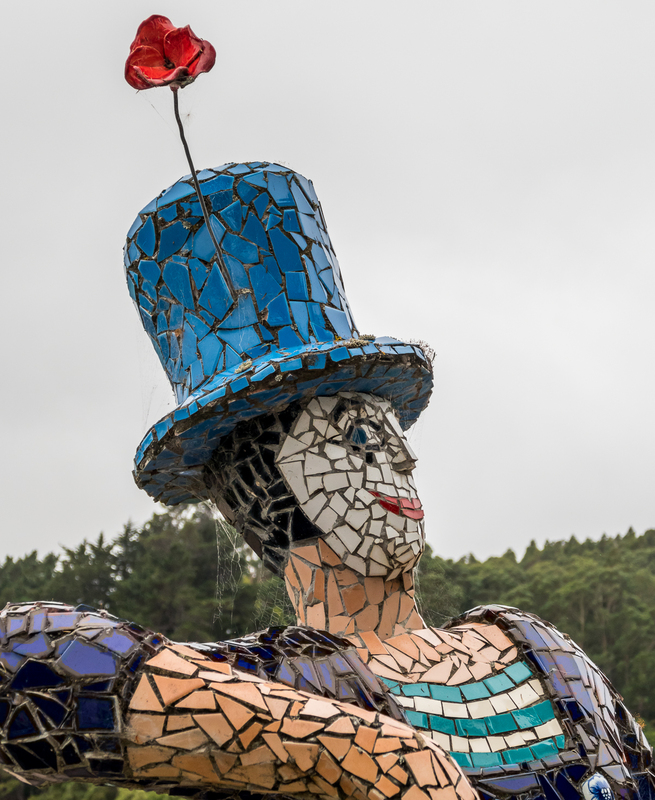 The lady who developed the Giant`s House and park must have a wonderful sense of humour – crazy fun! Christchurch is my favorite city in the world, but I am a little afraid to go there again and see it`s beauty partly destroyed. 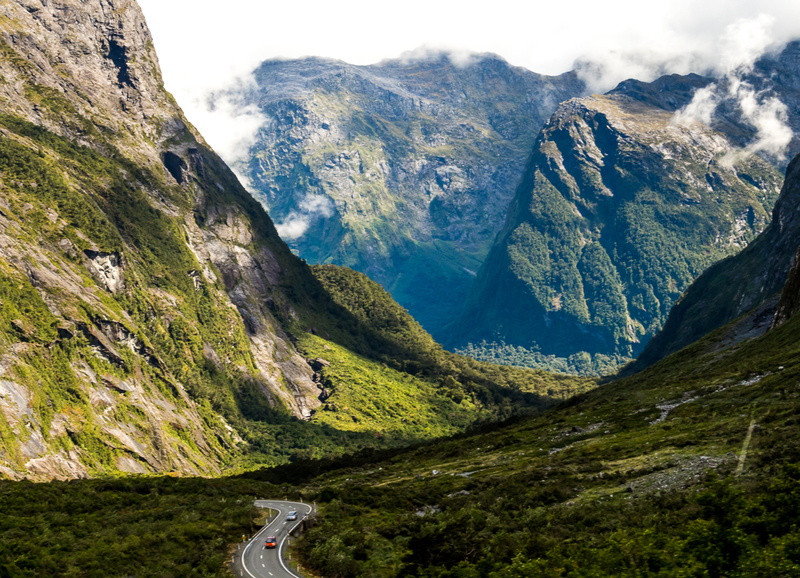 Of course Milford Sound is one of the wonders of the world. You make me desperately want to go back to New Zealand. Yes, I agree – she must have a great sense of humour, and a wild imagination. If you loved Chch before you would be heartbroken to see it now. But slowly the recovery and rebuilding is happening. Milford is glorious isn’t it?! We were so lucky to see it on a sunny day.